Dog owners know only too well that their beautiful, lovingly tended lawn or garden can quickly be damaged by a dog’s digging. And your dog can soon develop the digging into an annoying habit if you let them. So here are a few tips on how to stop a dog from digging. 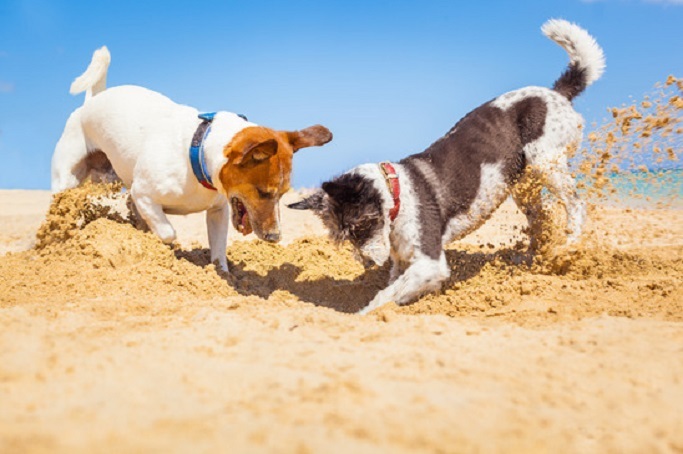 First, let’s take a quick look at some reasons why your dog may be digging. Once you know the reason for the digging, it’s easier to put a stop to it. Your dog may be trying to bury a favorite toy of theirs, or a bone, or some other item. Your dog is trying to create a cool (or warm) and comfortable spot to lie down and have a rest. Your dog can also be digging just because it’s such fun. For them not you, that is! Another reason your dog may dig is through boredom or just to burn off some energy. Knowing how to stop a dog from digging depends on knowing which of these reasons is the cause of the digging. Firstly, try to make sure you only give your dog treats and chew toys that they’ll finish in one go. If there’s nothing left, there’s nothing for them to bury! Secondly, if you do give your dog bones or treats and chew toys that they won’t finish, try to get them off your dog once they’re done with them. You can always give them back to your dog later. Again, if they don’t have the bone or chew, they can’t try and bury it. If the digging is because your dog’s trying to create comfortable spot for a rest, it could be that they’re too hot or cold. Make sure your dog has access to shade when it’s hot, and to shelter when it’s cold. And if you keep your dog outside, consider letting them into the house when the weather is very hot or cold. You can also try making sure they’ve always got access to a comfortable bed to lie on. If your dog’s digging because they find it’s fun, then it’s a bit more of a difficult problem to fix. You might find you can never get them to stop digging altogether unfortunately. So you may be better off just making sure your dog causes as little damage to your precious garden or yard as possible. Fence off, or otherwise block access to, any areas you particularly don’t want your dog to be digging up. If they can’t get to an area, they can’t dig it up and ruin it. Consider designating a small part of your garden as your dog’s special digging area where you let them do whatever they want. You’ll have to train your dog to only dig in this area. Don’t shout at your dog when they dig in the wrong area. Instead, gently show them their special area and give them lots of praise when they dig there. If your dog’s digging because of boredom or to burn off energy, the solution is simple. Give them something else to do instead! Make sure you give your dog enough attention. And make sure you give them enough exercise to burn off all their excess energy. The amount needed will depend on your dog’s breed – some need much more than others. And of course if you give them their own special digging area as described above, this can also help as they can relieve their boredom and burn off energy digging in this area. Many dogs love to dig and it can be a problem if you value your yard or garden. If so, first determine the reason behind the digging. Then try following the above tips on how to stop a dog from digging to try and fix the problem.